The post Create Stylish Stole At Home In Four Simple Steps appeared first on Live Creative. Wrap the yarn of any colour of your choice, around some – 200 times on the cardboard. The post Decorative Candles for Parties and Festivals appeared first on Live Creative. Merry Christmas and A Very Happy New Year To All Of You!!! Today we will learn new ways to Create Decorative Candles for our homes, to decorate on Christmas and our New Year Parties. Candles are everybody’s favourite and everyone uses them to decorate the house not only on any occasion but also on regular days. 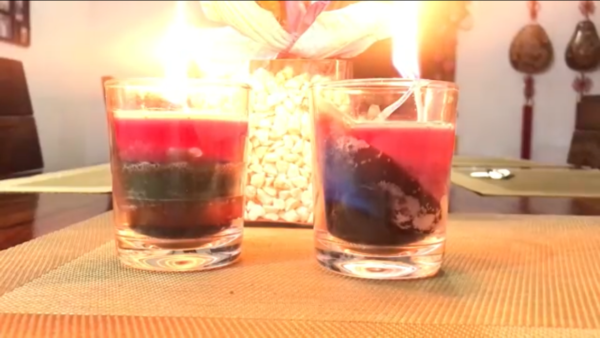 So, let’s learn whole new ways to create Decorative Candles at home. Melt some wax in a pan. 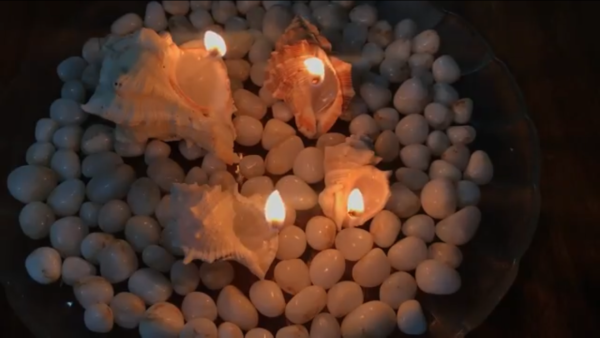 Place candle threads and Pour the melted wax in different shells. Let it cool. Place the shells on a glass plate filled with artificial decorative stones. Take two glass jars, place candle threads and pour the melted wax. Let it cool. Cut long strips, circles or triangles from a colourful paper. Paste them on the glass jars. 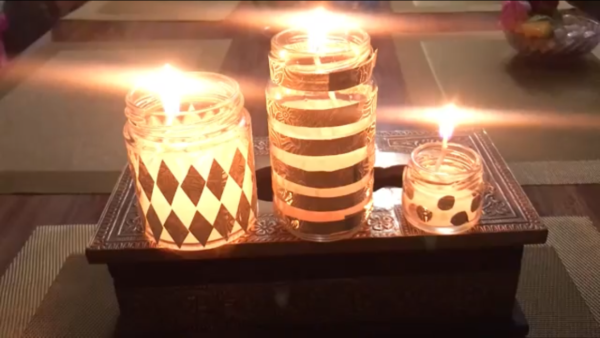 The caps of the jars can also be used to make candles. 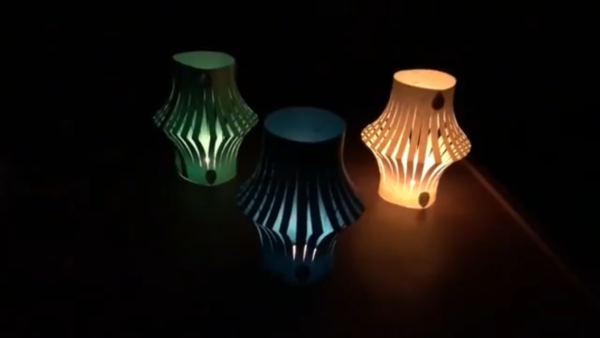 These candles can be made to float over water in a container. Place a crayon in the pan while melting the wax. This would add colour to the wax. Place a candle thread in the middle of the mould and Pour the coloured wax in the moulds to make colourful candles. Take three wine glasses and put different coloured pearl strings in them. These candles can be put over the inverted wine glasses, as shown in Pic. Melt wax and add crayons of the colour of your choice. Place candle threads in the two glasses and keep pouring the colourful wax. You can keep one glass slightly tilted to make patterns with the colourful wax. Take a decorative glass cup. 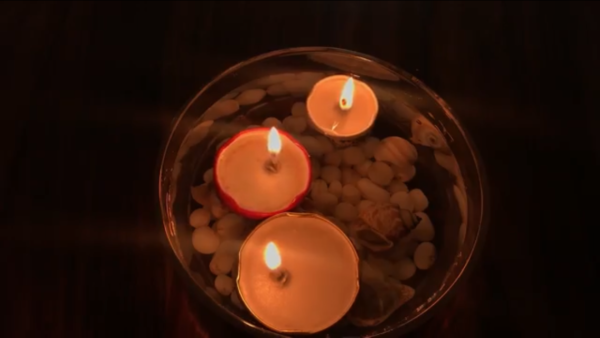 Place a candle thread in the middle and pour melted wax in it. 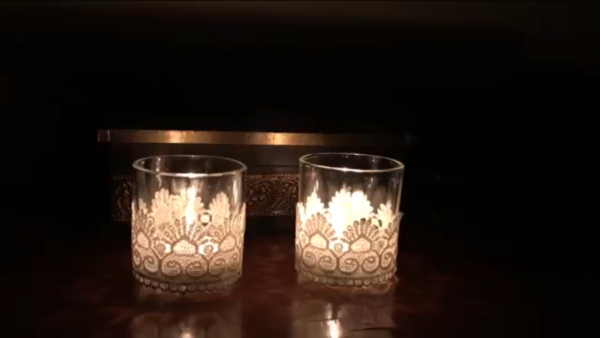 These decorative candles can be made to float in a tumbler full of water or kept in corners to illuminate them. Stay blessed, laugh loudly, pray heartily and Live Creative! 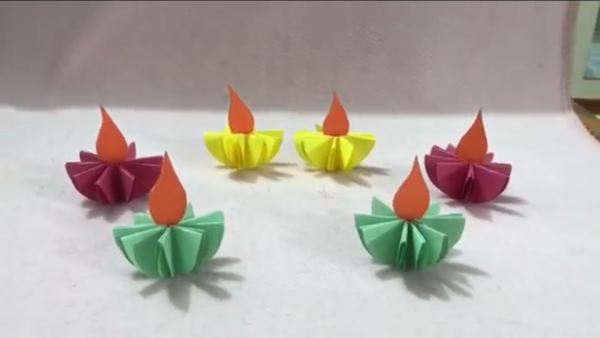 The post Create Beautiful Diyas and Lamp With Colourful Sheets appeared first on Live Creative. We in this article present to you Five very simple ways to create Diwali paper decorative pieces for your home. We would require just a few colourful paper sheets to do so. 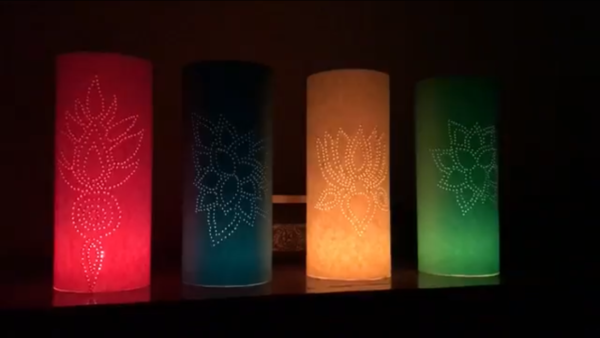 Not only on Diwali you may also use these decorative tricks to decorate your house for a party or a family get together. These paper decorative pieces can also be used to decorate the house on regular days as well. Make nine circles on a coloured sheet, using an old bangle. We have used a yellow sheet here, you may sheet of any colourful of your choice. Cut the circles out using scissors. Fold all the circles first into semicircles and then again fold the semicircles into quarters. Paste the quarters together using Fevicol. See Pic 2. Make flames on another colourful sheet and cut them. 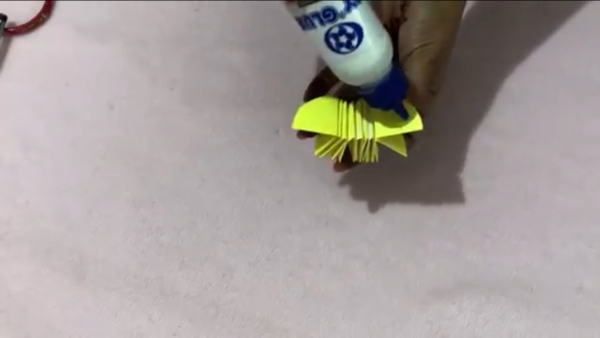 Paste the flames on the paper diyas that we made and as shown in the Pic 3. Make four circles on brown coloured sheet. Fold them in quarters and paste two quarters together. Similarly make four flames. Fold them into half and paste two flames together. Then on a woollen string, first paste one part of the diya and then the other part of the diyas. Likewise, paste the flames too. Make the remaining strings as shown in Pic 5. 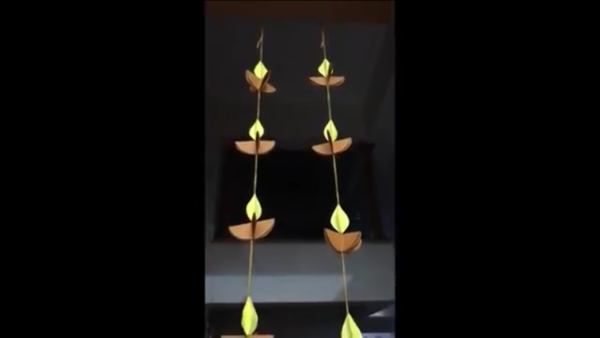 Hang these strings on entrances or walls or on beams on the ceiling. Cut out circles from a coloured sheet and make folds. Then paste a paper flame on the top. See Pic 6. Fold a colourful sheet into half and then cut it using scissors, as shown in Pic 7. Then fold the sheet and staple the ends. Paste Swarovski crystals on the upper and lower edges of the lamp. Place candles or diyas at night in the lamp. See Pic 8. Use any of the above paper decorative to decorate your house and Live Creative!! 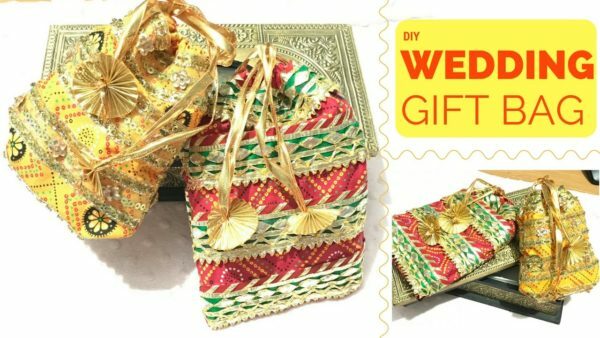 The post Create Decorative Diyas For Diwali appeared first on Live Creative. Diwali is approaching and so the preparations are in a full swing to clean and decorate our homes. 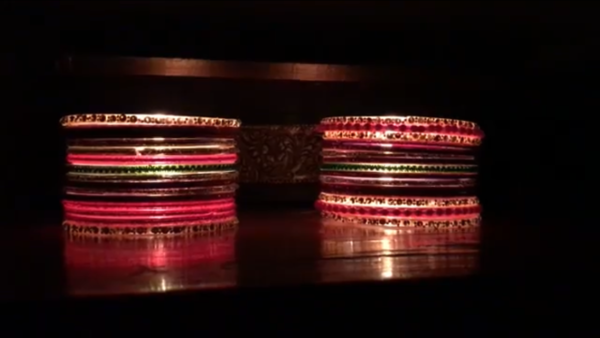 Diyas are the most common, simple and the most beautiful decorative items one can use. 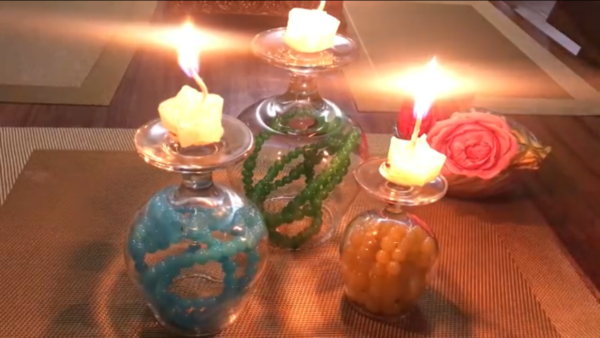 Today we will learn How To Create Decorative Diyas At Home for this Diwali. 1. Cover the candles with colourful tapes. 2. 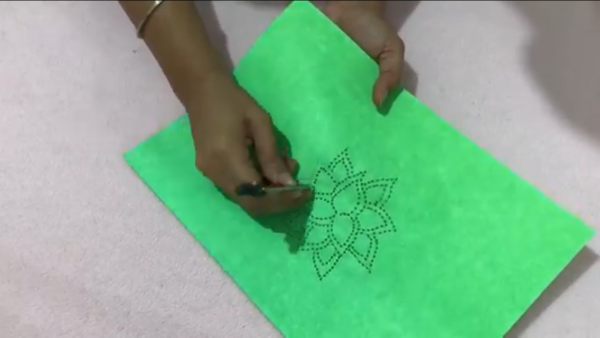 Take a colourful sheet of paper and make a flower or any other pattern on it. Then using a compass make holes in the entire pattern as shown in Pic 2. Fold the sheet around and staple it with a stapler. 3. Take a regular sheet of paper and fold it from the middle and then fold both the sides too, to give it a shape of a rectangular box. Draw and cut out patterns on it. Paste colourful, translucent sheets at the back of the pattern. Then staple the box. See Pic 4. 4. 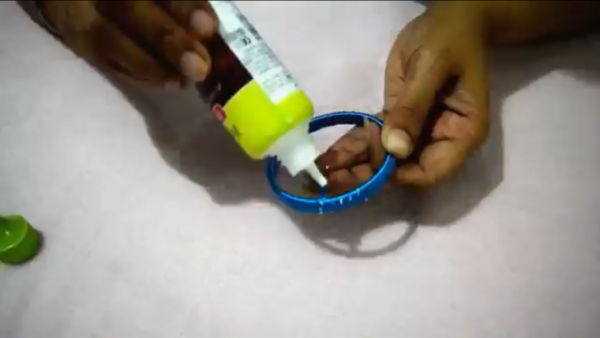 Take old bangles and paste them one above the other using fevicol. Place a diya inside it. See Pic 5. 5. Take two glasses and apply fevicol on the lower side of the glasses. Then sprinkle sparklers on the fevicol. 6, Take two glasses and paste a lace over them using fevicol. See Pic 6. You may follow any of the ways or all of them and make your Diwali diyas look different and attractive. The post Create Stylish Shaded Denim Handbag At Home appeared first on Live Creative. 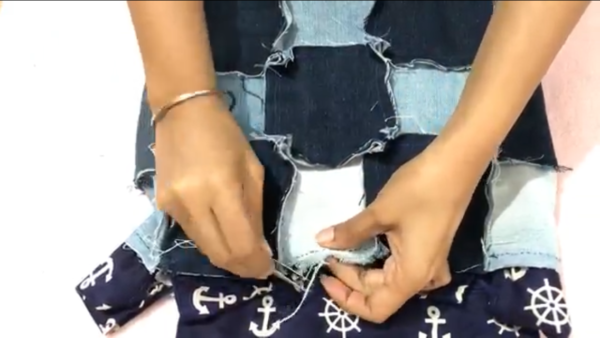 In a previous article we taught you How To Create a Tote out of your old jeans, today we will teach you How to Create a Stylish Shaded Denim Handbag, that too using your old denim. Mark and cut 13 squares measuring 10x10cms from the first jeans. Similarly cut 14 such squares from the second jeans. Arrange nine squares as shown in Pic 2. 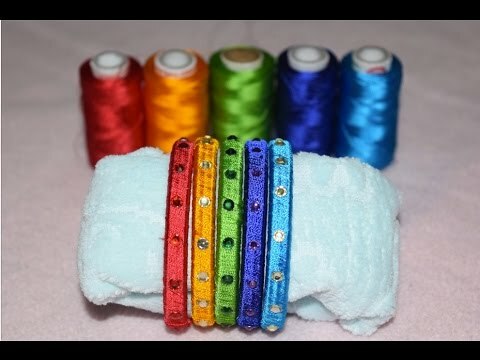 Now sew all of them one by one to each other, using thread and needle . You may use a sewing machine as well. Make sure while stitching you leave a margin of half an inch. Similarly make the other side of the bag following the same process. Now attach the two sides of the bag and the denim line to each other. Take the printed cloth and spread it. and start cutting the printed fabric, leaving extra margins. 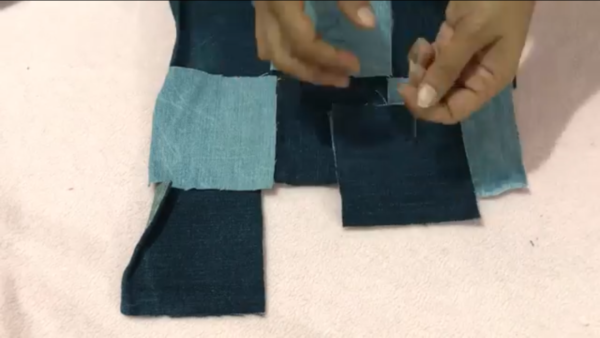 Sew the cloth and the denim pattern together from the inner side, using thread and needle. 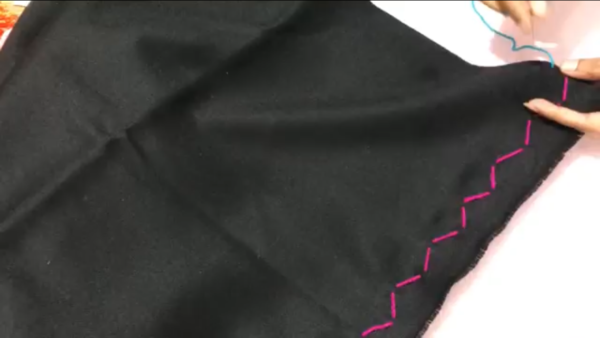 Fold the extra margins of the cloth and sew it inwards making a passage. Pass a ribbon through this passage and tie a double knot. Cut two long and wide strips from the remaining part of the jeans. Fold the strip and sew the edges to prevent from unfolding. Similarly sew the other strip too. Attach these strips to the sides of the bag to make the handles of the bag. 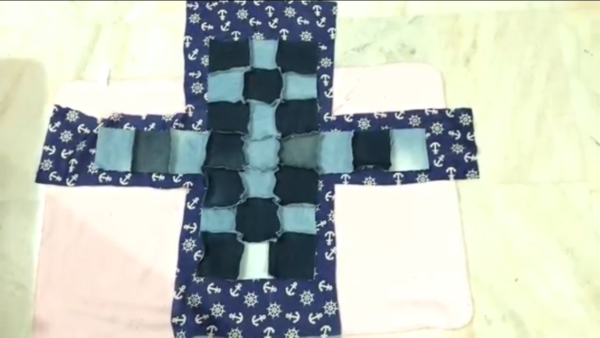 Using forceps remove the horizontal threads from the edges of the denim squares on the bag. See Pic 4. Your stylish denim handbag is ready to use. Carry it to your kitty and impress your friends with your intelligence and creativity!! 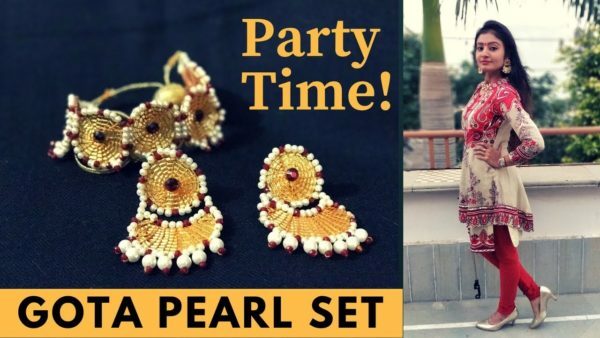 The post KarwaChauth Special Gota Jewellery – Part II appeared first on Live Creative. 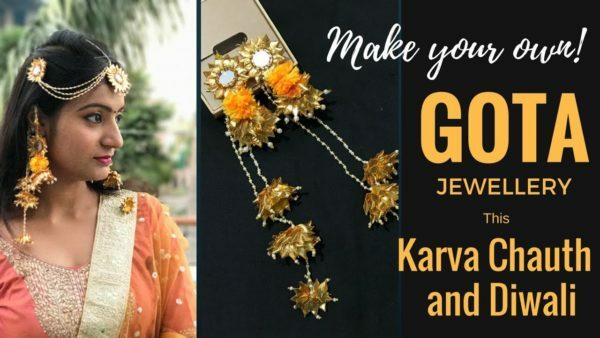 We shared with you a few days back an article on KarwaChauth special gota jewellery, in the sequence we have brought you one more article, KarwaChauth Special Gota Jewellery Part – II. Make a circle using a compass, with a radius 2.5 cms. Make a small cut on the circle till the radius and fold the circle in a way to make a cone. Stitch the cut with thread and needle. This would keep the cone in shape. Now start sewing the gota lace on the edges of the cone and finally sewing it all over the cone. Stitch the last edge of the gota nicely on the cone to prevent it from unfolding. Sew white and small golden pearls on the pointed edges of the gota cones that we have created. Cut a circle of radius 2 cms on the arkandy cloth and stitch gota on its edges. Just the edges are to be covered by the gota, the centre is to be left empty. In the centre of this circle, attach a mirror using zari thread. Make a star like pattern around the mirror with the thread. Make two pom-poms using wool and a fork. Wrap the wool over the fork some 50 times and then pass another woollen thread through the middle of the wrap and tie a double knot on both the sides. Take the wrap out and cut its sides using scissors. Attach one gota cone, followed by a Pom-Pom and a gota cone to one another using thread and needle. This would make for your gota jhumka. 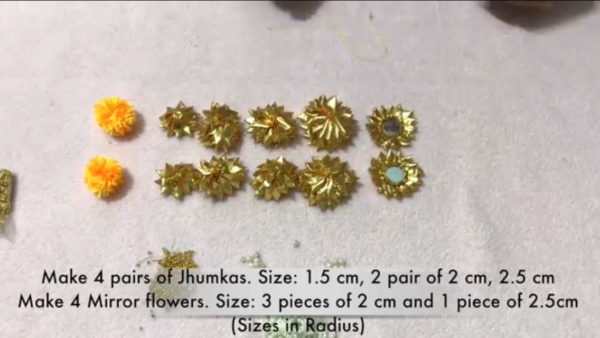 Paste a plain gota flower at the back of the upper part of your jhumka. Attach a earring hook on the upper edge of the gota flower and start sewing white and golden pearls in order to make a long string. Two long pearl strings are to be made for each earring. At the end of each pearl string we would attach the gota cones that we created in Step One and Two. Take a mirror flower and start sewing white followed by golden pearls on one of its pointed edge in order to make a string. Likewise make three strings. Then attach another gota flower at the other end of the strings together. Also attach a plain hook at the back of the gota flower. Make one more pearl string and attach a hook at the end of this string. Wear this elegant gota set on this KarwaChauth and get all the valuable attention from everyone around. The post KarwaChauth Special Gota Jewellery – Part I appeared first on Live Creative. Every year there is a lot of excitement for Karwachauth, especially amongst young couples. Ladies wear beautiful dresses with ornaments to look as attractive and beautiful as possible. So this article is special written and posted keeping in mind the special feelings for this special occasion. 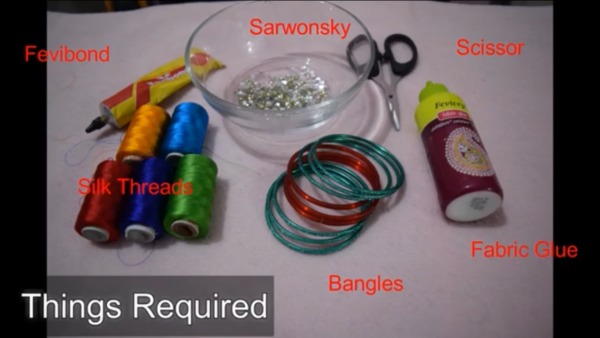 Today we will learn How to Create Special Gota Jewellery for karwachauth. Make two cardboard circles, six octagons and two semicircles, using compass as shown in Pic 2. 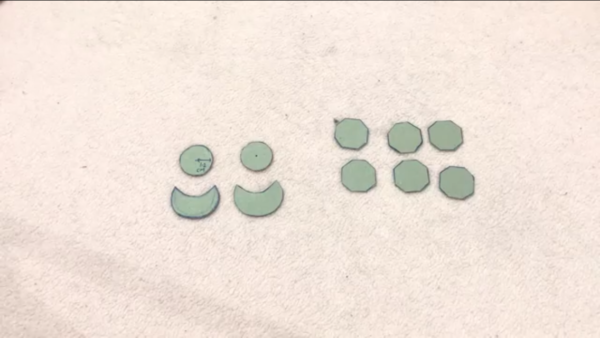 Take the two circles and punch holes in the centre using punching machine. Pass one end of the gota through the hole. 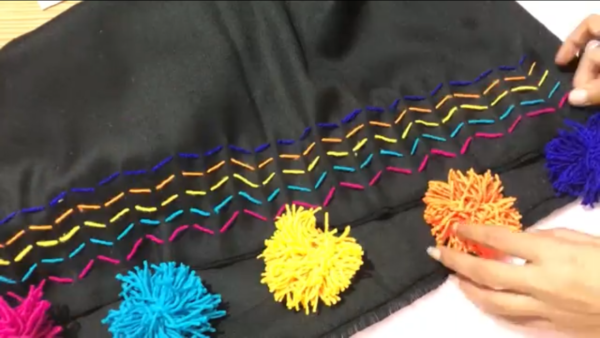 Apply fabric glue on the circle and paste the end of the gota on the circle. Keep passing the gota through the hole and pasting it simultaneously on the circle. Cover the circle entirely. Stitch a red pearl followed by three white pearls on the edges of the circle. Again place a red pearl followed by three white pearls. Cover the entire edge like this. The remaining structures are also to be decorated like this. As we covered the edges of the circle with white and red pearls, similarly decorate the semicircle also with white and red pearls. Also attach big white pearls on the lower side of the semicircle as shown in Pic. 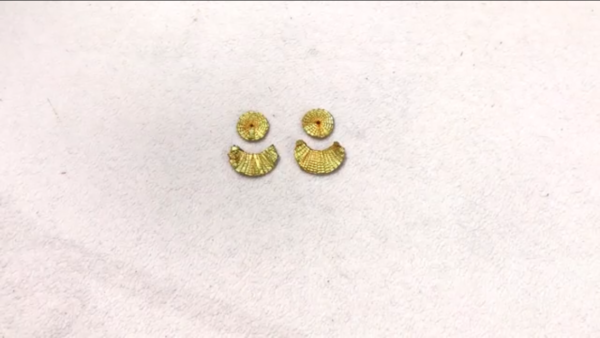 Attach earring hook to the circle using thread and needle. 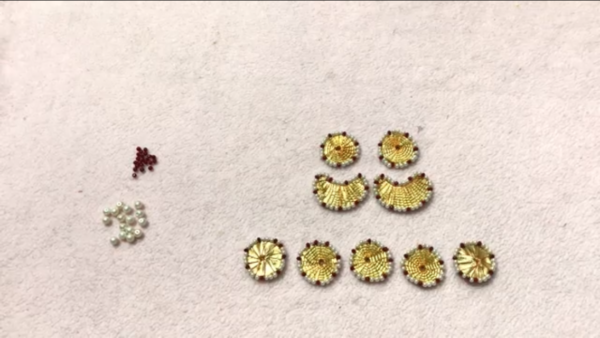 Sew three small white pearls onto each pointed side of the semicircle. Attach the other end of the pearls to the gota circle that we created. See Pic. Paste a Kundan in the centre of the circle using fabric glue. 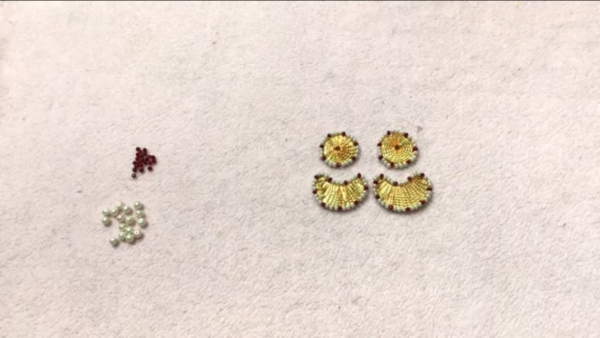 Make the other earring following the same process. 1. Take the cardboard octagons and cover then with gota as described in Step One. Then decorate them as described in Step Two. 2. Attach three big, white pearls to each octagon. 3. Sew all the octagons together by passing needle through the pearls sewen on their edges. See Pic. 4. Then make a loop using pearls on both the sides of the necklace as shown in Pic. 5. 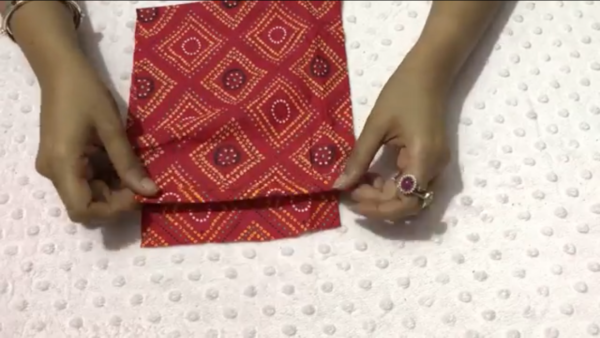 Attach a zari thread to both the loops and use a big golden bead to join the ends of the zari thread. Your gota necklace and earring set is ready. Wear it with your saree or suit and stun your husband this karwachauth. The post Create Attractive Gift Pouch At Home appeared first on Live Creative. The post Create Silk Bangles At Home appeared first on Live Creative. 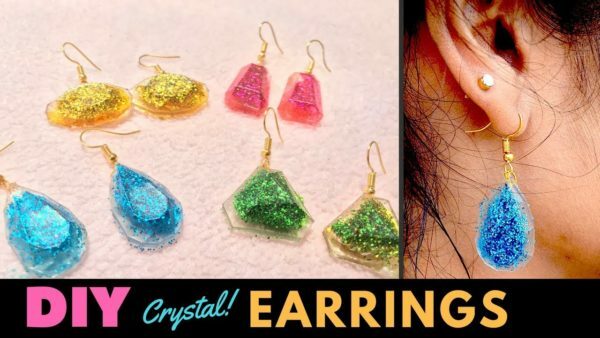 The post How To Create Beautiful Crystal Earrings At Home appeared first on Live Creative. In a previous article I had discussed How to create Fancy Jewellery at home using Crystallo Resin and Hardner. In the same series, we will learn How to create Crystal Earrings at home, with Crysatllo Resin and Hardner. Mix three spoons of Crystallo Resin and one spoon of Crystallo Hardner in a bowl. Take a plastic mould and pour in it the mixture that we created in Step One, as shown in Pic 2. Add sparklers to the solution that was poured into the plastic mould, as shown in Pic 3. 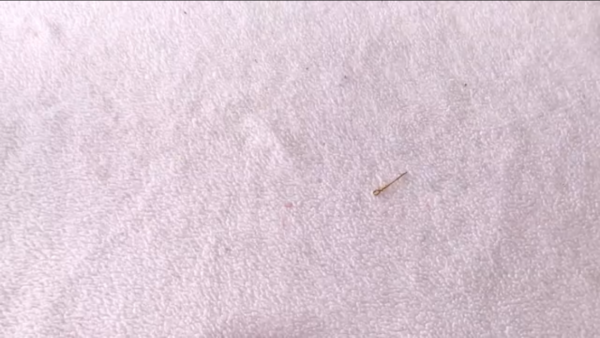 Take the metal wire and cut a small piece from it, using a clipper. Fold the wire in a way to make a loop, as shown in Pic 4. Place this metallic loop in the solution. Spread the sparklers throughout the solution with the help of a brush and pour some more solution over it. Leave the solution to dry for 24 hours. After 24 hours, take the crystal earrings out of the mould. You will notice that the solution would have solidified and taken the exact shape of the mould. See Pic 5. Attach the loop on the earring hooks to the metallic loop that we had placed in the solution before it had dried. Your Crystal Earrings are ready to wear. Note: Plastic moulds are easily available in any super market. Here we have used a plain plastic mould, you may use special moulds depicting cartoon characters, monuments or specific objects.